This 9-day program will take you through the fascinating and rugged landscapes of Namibia, visiting the iconic highlights including Kalahari Desert, the Quiver Tree Forest, Fish River canyon, the Namib Desert, and Swakopmunda. 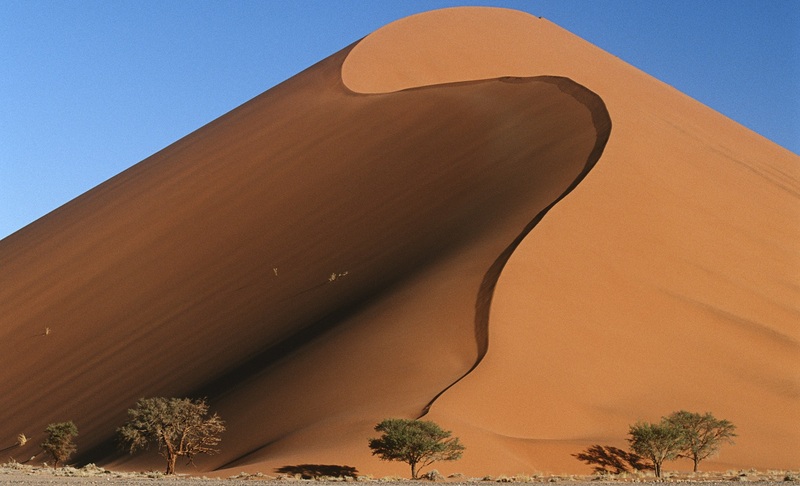 Experience the Namib, a vast and picturesque coastal desert stretching 1200 miles along the Atlantic Ocean. Cross the border into South Africa and follow a Garden Route Self-Drive tour from Cape Town to Port Elizabeth. Fly direct to Zimbabwe and add on a popular short trip to Victoria Falls. Travel to Cape Town for its premium quality wineries and an abundant of wildlife reserves nearby. 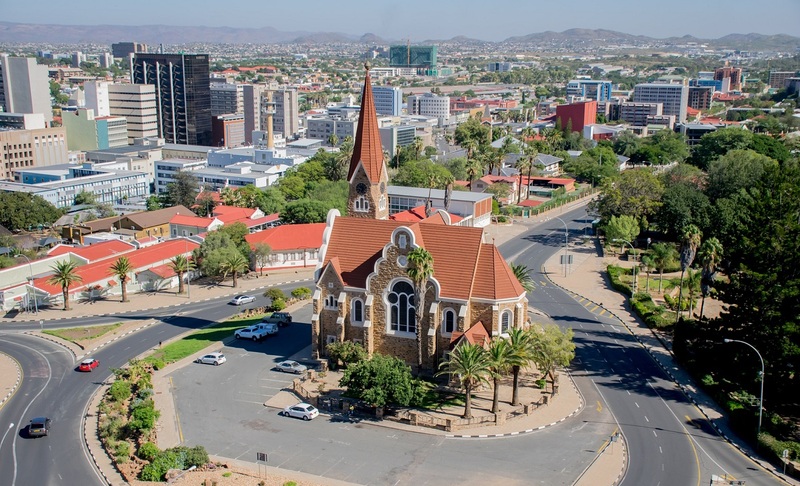 Departing from Windhoek, you will travel into the largest sand mass on Earth, the Kalahari Desert. The Kalahari is a vast semi desert of wind-blown sand held by a sparse mantle of thorn scrub making it the largest continuous stretch of sand covering 9 African countries. 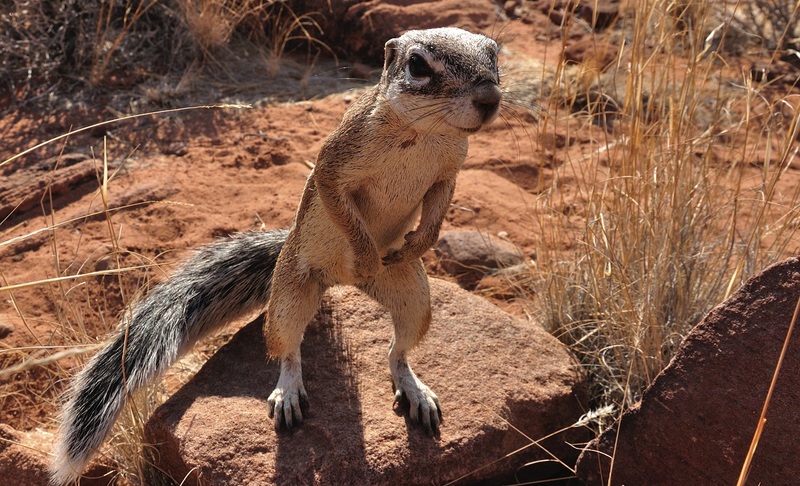 Unlike other true deserts, the Kalahari does receive erratic rainfall. For many therefor “thirstland” is a more fitting description. 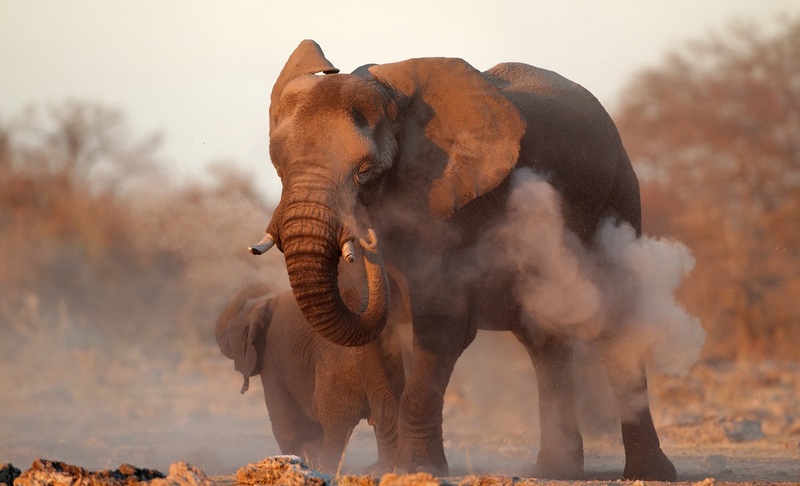 Lacking permanent surface water, the Kalahari is a challenging place to live except for those who have adapted to not only survive but flourish here. 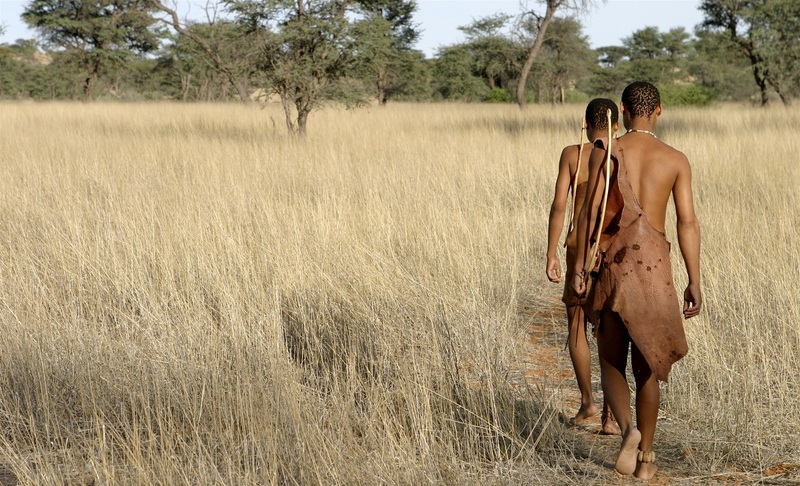 The Bushmen refer to it as the “Soul of the World”, an emotive description for this area! 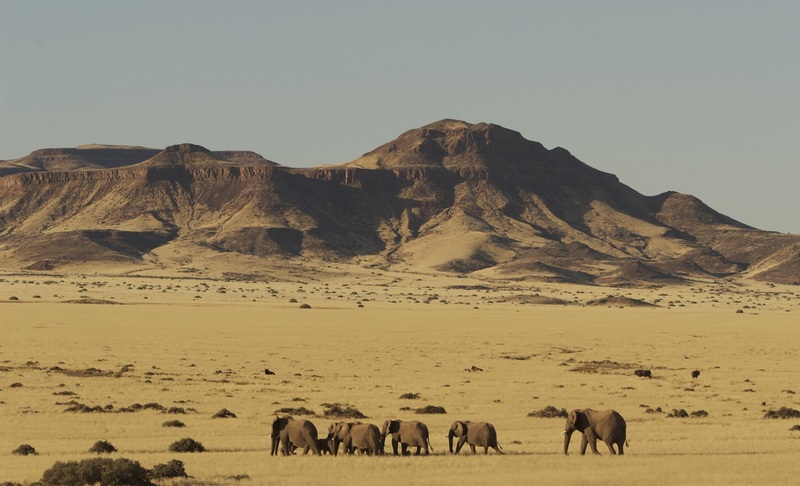 With its deep red sand dunes and endless grass plains interspersed with acacia’s and shrubs, it is still home to a surprising large amount of specially adapted wildlife. Enjoy the opportunity to experience the red dunes, wildlife and plants, in this desert environment on an optional nature drive. Continue south through arid and extensive rocky plains. Visiting the unique Garas quiver tree forest you are welcomed by quirky man-made sculptures of scrap metal which set a contrast to this serene, timeless space with Quiver trees and aloes nestled amongst huge dolerite boulders, stacked in a mysterious way, the area is also aptly referred to as “Giant’s Playground”. Continue to your lodge, situated in close vicinity to the Fish River Canyon. Here you can explore the area on foot or on an optional guided nature drive in the later afternoon highlighting the Quiver trees, rugged landscape and impressive sweeping rock formations. The morning begins on the edge of the Fish River Canyon, a fantastic point to gaze into this magnificent geological phenomenon. The Fish River Canyon is located in the northern part of the Nama Karoo and is the second largest canyon on earth, featuring a gigantic ravine that measures in total about 160 km long, up to 27 km wide and in places almost 550 meters deep. The Fish River is the longest interior river found in Namibia, but its current flow is just a drop compared with the immense volume of water that poured down its length in ages past. Continue the journey past the Naute dam, where you shortly stop at the Naute Kristall Cellar and Distillery, to optionally taste some of the unique liquors or simply enjoy a delicious cup of coffee. Proceed towards the coastal town of Lüderitz. On the way to Lüderitz the group will stop at Garub, viewing point for the Wild Horses of the Namib Desert. Start your morning with a visit to Kolmanskop ghost town. Kolmanskop is a deserted Diamond Mining Town in the Sperrgebiet National Park. Once an opulent and decadent town, a monument to the Diamond boom and built to last…until the diamonds ran out. Today Kolmanskop stands as a haunting monument to the thriving past, offering visitor’s unique photo motives into a bygone era. On the return to town, you will visit Diaz Point with its Padrao on a cliff overlooking the harsh Atlantic Ocean commemorating the initial Portuguese explorers and explore the forlorn coast. Arriving back in Lüderitz, you have time to explore this small, historic town. 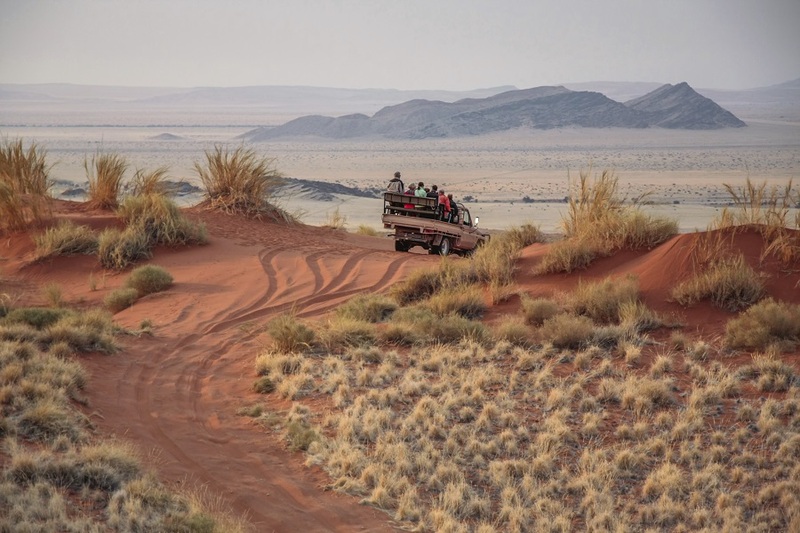 Rise early for an excursion into the Namib Naukluft National Park. Witnessing sunrise here is mesmerising with the first rays of sunlight painting the mountains of sand into a variety of apricot, red and orange, contrasted against a crisp blue skyline. 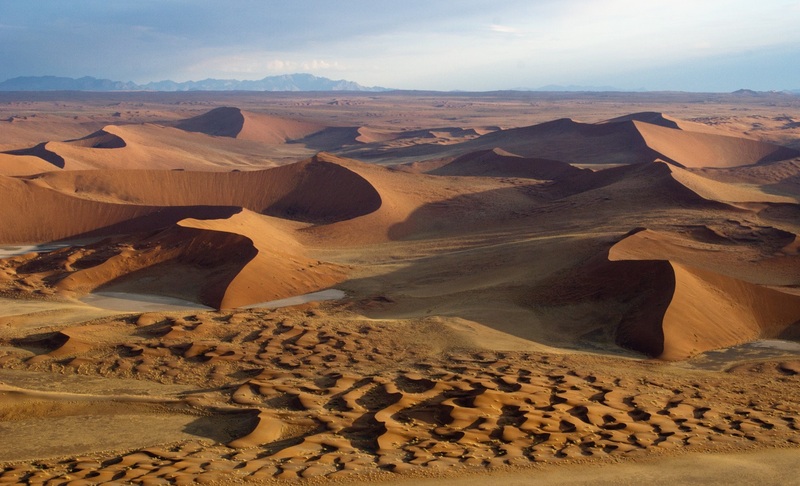 You will be captivated by the surreal Deadvlei surrounded by some of the highest dunes on earth and Sossusvlei, where the dry Tsauchab River ends abruptly amongst dunes. Take the opportunity to walk up one of these majestic dunes to admire the desert landscape beneath. Afterward visit the Sesriem Canyon, a life sustaining natural phenomenon in the heart of the Namib Desert. After breakfast, continue the journey approaching the little settlement of Solitaire on the edge of the Namib Naukluft National Park, feeling like you have arrived in the middle of nowhere. Here it is worthwhile to enjoy a cup of coffee with the delightful apple-pie written about in so many travel books before travelling via the desolate, rolling hills of the Kuiseb Valley towards the Atlantic Ocean. Reaching the coastal harbour town of Walvis Bay, you will visit the shallow lagoon, one of the most important wetland areas on the African continent and a RAMSAR World Heritage Site. Over 80% of the African flamingos feed in this lagoon and present a breath-taking picture when they appear in groups. Continuing along the scenic route between the dune belt and the Atlantic Ocean we reach Swakopmund, where the rest of the day is spent at leisure. With palm-lined streets and seaside promenades, Swakopmund is a popular holiday destination in Namibia. Its pleasant summer climate and long stretched beaches attract anglers and surfers from all over Southern Africa. Swakopmund is often fondly referred to as the “playground of Namibia”, it has numerous activities ranging from, adventure to exploring the fascinating features of the Namib Desert and the animals and plants that occur and survive here. Embrace the relaxed pace of this idyllic coastal town whilst enjoying coffee and freshly baked pastries in one of the many café’s. Alternatively explore the rugged, sweltering desert on a day tour, or view this awesome, environment from the air on a scenic flight. Find your inner child and push adrenaline to its limits with extreme adventures such as skydiving over the desert or quad biking and sand boarding on the dunes. Take time to get the feel of this quaint town with its historic buildings, museums, shopping arcades and beach bar that has transformed into its own personality by the vibrant use of colour and the bohemian lifestyle. After breakfast, you will be transferred to Windhoek to either your hotel or the airport for your departure flight. This tour operates with a minimum of 2 passengers and a maximum of 20 passengers. English departures only: 6 Apr 19, 29 Jun 19, 7 Sep 19 and 5 Oct 19. *Lodges and camps are subject to change due to availability.